We’re focusing on money this week with Mint, an app that promises to help you keep on top of your finances. 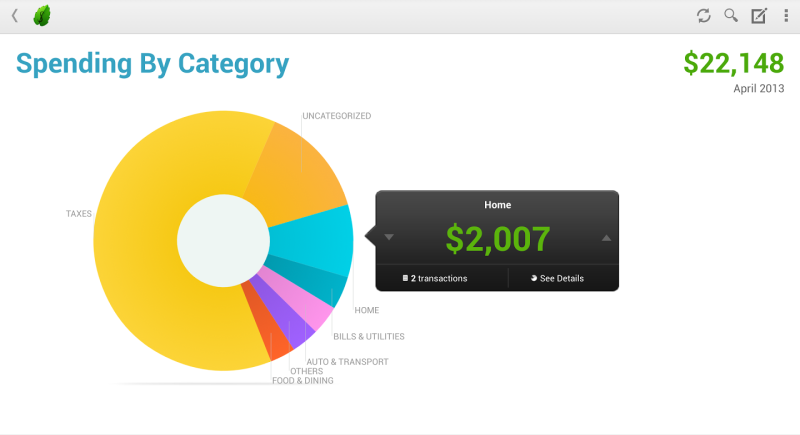 Mint is a personal finance app that allows you to keep track of what you spend compared to how much you earn. Based on this data, the app gives you a monthly budget and breaks down the confusing amount of financial data we all have to deal with every month (loan repayments, credit cards, etc.). Mint tells you everything you need to know about your finances, from how much you spend on ice cream to how big your credit card bill is this month (too much ice cream, obviously). The best part is that all this data is presented at a glance. Mint tells you how much you’ve got left to play with so you don’t have to mess about with calculators and abacuses while looking at your accounts and assets. It’s very easy to manage. Just enter your account details and Mint will draw data from the previous 6 months. From there, it’ll calculate how much you spend every month and how much you earn, giving you a final budget figure. You can’t adjust your budget using the app, which means having to log on to the main Mint site every time you get a bit of extra cash (from musicMagpie, perhaps?). It’s quite slow to update your details too, which can lead to an inaccurate budget (example scenario: if you go on a shopping spree and then want to know how much you’ve got left for a fancy dinner the same night). But for month-to-month financial management, it can’t be beaten.